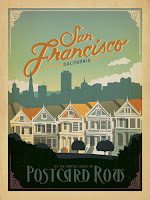 My favourite American city is San Francisco. I'm delighted to be heading there next weekend. If there are any tips and hints and places to see then I'd be delighted to hear them as I've not been for ten years. I'll be staying in Union Square in the centre of the city and therefore pretty handy. I've got a tour of Alcatraz booked in, which I'd not done before, and I'm not drinking at the moment. Anything else considered. When I stayed in 2000 I saw an art deco poster from the 1920s. I have never been able to find it online or in any shop in the USA. I also tracked down the poster from an Oasis concert in 1996 I went to and it was rubbish - quite embarrassingly so - and therefore developed a bit of a mission to find some San Francisco art for our home that reminds me of this wonderful city. The fall back position is this poster, left from designers Anderson Design Group.